Our Research Ambassador Program Fellows have taken time during their visits to work with the youngest attendees of The Evergreen State College – the children at the Evergreen Childcare Center. Presenting at the center has taught our fellows to distill their science to the fundamentals that children can understand and appreciate. Some have brought pictures of bugs, some have made mud with the children, and others have shown bottles of algae. All have connected with the children. As the Program Manager, when I walk into the Childcare Center these days, I’m promptly asked by a gaggle of children, “What kind of scientist is here today?” It is wonderful to have a dozen 4-5 year old children so excited to connect with science! As visiting fellow Denise Bruesewitz discussed her research, campus photographer Hannah Pietrick took great photos and audio, capturing the essence of the experience. In November we launched a partnership with Senior Services of South Sound to introduce seniors to the science of mosses. 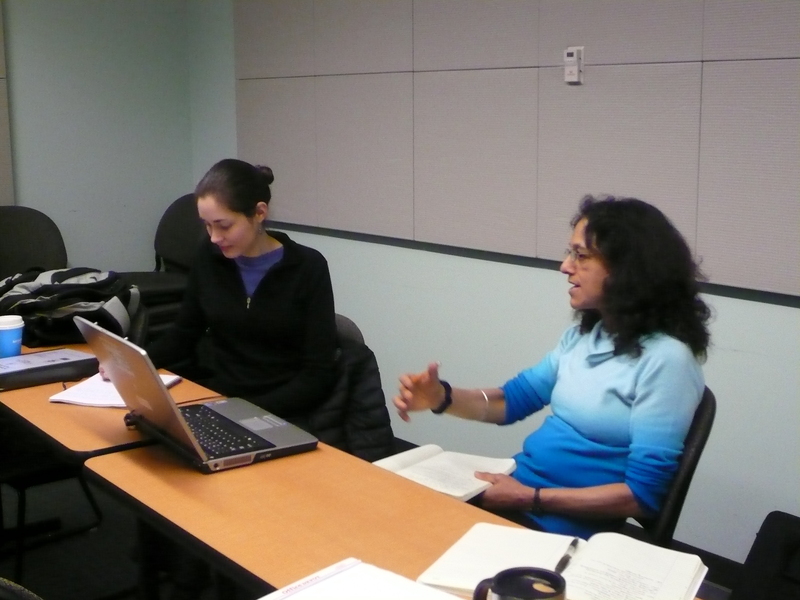 After attending a lecture and workshop with The Evergreen State College visiting faculty member, Lalita Calabria in November seven seniors agreed to partner as scientists. Lalita has developed an experimental design to observe comparative growth of two species of moss on bark and soil substrates. The horticultural industry currently harvests moss ; we’d like to learn how to ‘grow’ mossess commercially to eventually reduce pressures on wild populations. This project launched last week (February 22) with the ‘planting’ of mosses on bark and soil substrates. Yesterday (March 2) we returned to perfect our measuring techniques. A team of undergraduate students and seniors will be returning weekly to observe growth and take measurements. John Dodge of the The Olympian, our local newspaper, was there to report on our work and hopes for the project. On January 11-14, 2011, we hosted our first Research Ambassador Fellow, Katie Renwick. Katie is a junior scientist, embarking upon her doctoral studies with the Natural Resource Ecology Laboratory at Colorado State University. Katie’s research focuses on disturbance dynamics in Lodgepole Pine forests, particularly the ecosystem interactions of fire and pine bark beetles. For three days, Research Ambassador staff members Nalini Nadkarni and Amy Stasch presented innovative ways for Katie to engage in science outreach. We considered about how events in forests may parallel events in human lives. Although people cringe at the sight of a charred hillside because of their “Smoky the Bear” training that fire should be suppressed, ecologists understand that fire is a natural disturbance in forest ecosystems that perpetuates a healthy cycle of renewal and re-growth. Similarly, although illnesses and life’s struggles cause difficulty, we learn and grow from the experiences, often putting our own lives in perspective. This idea of disturbance became the central theme of Katie’s visit – the parallel message that we could use to relate her science to new audiences. During her visit, we met with hospice staff – nurses and social workers who ease the final days of people’s lives. Katie studied models of outreach that the Research Ambassador Program has gathered. Scientists routinely present their research at conferences, in classrooms, and to peer groups, but it is quite different to present their works to public audiences that are unfamiliar with statistical techniques and field sampling methods. We carefully studied each image, graph, and technical term used in her presentation, figuring out which strengthened her talk, and which might confuse people. On Thursday, we headed to Mission Creek Correctional Center for Women, outside Belfair, Washington. In the past few years, The Sustainable Prisons Project has organized a lecture series at Stafford Creek Correctional Center and Washington Corrections Center for Women, but hadn’t yet stretched into Mission Creek. After going through security, leaving keys and cell phone in the locker, we entered the cavernous room used for physical education. About 50 people attended – both staff and inmates. For nearly an hour, Katie described her scientific work on Lodgepole pines, the fire cycle, mountain pine bark beetles, disturbance and recovery. The audience showed tremendous interest and eagerness, enthusiastically peppering Katie with insightful questions. At the close of the talk, the audience took some time to reflect upon the disturbances in their own lives, and their capacity to learn and grow stronger. We returned to campus, and prepared for a scientific seminar with faculty, students, and staff of The Evergreen State College. Having both events on the same day allowed us to directly compare the experience of communicating with a prison audience and an academic audience. Although the core of her talk remained the same, with the Evergreen audience, Katie more fully explored research trends and findings. Throughout the week, we also facilitated opportunities for Katie to informally interact with faculty, students, and our Research Ambassador Program and Sustainable Prisons Project teams. It was a valuable week for all involved, as Katie deepened her outreach skills, we realized that the Fellowship model can be successful, and faculty, students, staff, and inmates interacted with current science and an emerging scientist. We’re particularly excited that this group includes researchers well established in their professions, and younger scientists early in their research. We’ll update this blog more frequently as we host outreach events and our offices get even busier. The Research Ambassador Program is exploring new partnerships and new types of events. Early this fall, we began looking for an active and accessible organization to work with to enable us to reach senior audiences. We identified Senior Services for South Sound, a local non-profit that serves a broad spectrum of local seniors through meal programs, day services, and activities. We hosted our first Research Ambassador event, a lecture and workshop about moss by Dr. Lalita Calabria, on November 10, 2010. Dr. Calabria spoke about the unique characteristics and biology of mosses for about 45 minutes, which was followed by engaging questions from the audience. Dr. Calabria set up a dissecting microscope so the seniors could examine the tiny features of moss that are almost invisible to the naked eye. Seniors were also invited to construct their own moss terrarium, which they could take home. Over the coming months, they can observe the mosses grow and thrive in their homes, learning about water and nutrient needs of these plants. 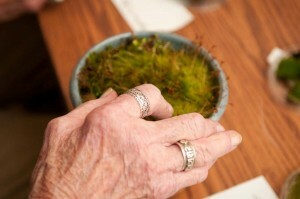 Perhaps visiting grandchildren may ask about their small moss gardens– and the seniors will be able to share some of the knowledge they’ve gained. Seniors represent an audience that is accessible to nearly every academic scientist. There are analogues to the Senior Services for South Sound in nearly every community in the country. This part of our society – through not as mobile or vocal as youth and young adults, are receptive, interested in nature and learning, and can themselves become conduits of scientific information to others. We are currently recruiting for Research Ambassador Fellows. The Program will provide funds for travel and per diem at the Research Ambassador headquarters in Olympia, Washington. During this time, staff will offer communication training, mentoring, and multiple outreach opportunities, including speaking engagements (depending on individual preferences) in state prisons, places of worship, and elderly care homes. This provides a unique opportunity for us to network with scientists, use our extensive network of local contacts, and help build your portfolio and confidence in public outreach. Schedules and opportunities are flexible – so open your calendars and book of ideas, and give us a call! This note is an announcement/reminder for a workshop on ecology outreach to non-traditional public audience at the upcoming ESA meeting. Entitled: Got Broader Impacts? How the Research Ambassador Program Can Turn Outreach from Burden to Benefit, this workshop will help guide ecologists to create and implement useful and creative broader impacts in an efficient ways. We will draw upon successful models whose audiences include faith-based communities, legislators, artists, urban youth, and incarcerated men and women. Workshop participants will be asked to complete a short “outreach profile”, which will help to focus the outreach scenarios we design to maximize the appropriateness of the audience and the mode of communication. We anticipate that each attendee will leave the Workshop with new and useful ideas for ways to bring their ecological research to public audiences that go well beyond academia. This workshop is part of the new “Research Ambassador Program”, which has been funded by a research grant from the Ecosystems Program at the National Science Foundation. Workshop attendees will become eligible for becoming a “Research Ambassador”, which provides access to further outreach training, resources, and evalution materials. Because this Workshop does not require signing up in advance, we would appreciate your sending us a note if you intend to attend so that we may better plan our activities. Below is the Workshop description. The workshop will take place on Monday, Aug. 2, from 8-10 pm, in 414 David Lawrence Convention Center. With the increasing gulf between humans and nature, and pressing global environmental issues, high-level science administrators are calling for scientists to participate in the dissemination of their work to non-scientific audiences. However, little training exists for scientists to be effective, efficient communicators. The academic system has few rewards for outreach by scientists, and can even actively discourage them. However, funding sources such as National Science Foundation (NSF) are increasingly demanding that such work be done. In 2010, the Ecosystems Program of the NSF made an award to create the Research Ambassador Program. Our objectives are to recruit, train, and provide assessment tools for ecologists who wish to present their work to non-scientific audiences, particularly to audiences with little access to nature, or for whom science is not a part of their regular interests. This workshop draws on five years of successful science outreach to non-traditional audiences. In our session, we will: (1) articulate the obstacles and rewards that scientists face when carrying out research outreach; and 2) present successful case studies for such audiences as incarcerated men and women, faith-based communities, and urban youth. Then, each participant will describe his/her own research topic, and we will collectively brainstorm potential audiences and modes of communication by which outreach can be implemented. Finally, we will present models for materials that evaluate the audience’s and the scientists’ shifts in knowledge of content, attitudes, and behaviors. We have gone “live” with our updated and revised website! We will update this site, particularly this “blog” page frequently. Ultimately we hope this blog will serve as a platform for dialogue, for brainstorming, and for developing creative outreach ideas. Feel free to comment and help build a vibrant community of researchers engaged in outreach.